With any marketing method, call to actions are absolutely crucial. If you fire out an offer, but forget to include the call to action, you’ll be totally out of luck. You will experience little to no offer redemption. And, to bring it around full circle, if customers aren’t redeeming your offers, why even bother? Your marketing campaigns will be a waste of time and money. So, with that said, you must, absolutely MUST include a call to action in all text marketing campaigns. For example, we work with tons of restaurants that have chosen to partner up with our online texting service. And nine times out of ten, these restaurants experience great success with our service. But, every once in a while, we’ll hear from a customer that just isn’t getting the results they want. Well, after doing a bit of investigating, we come to find out: these customers aren’t including a call to action in their text campaigns. So, to avoid this problem, don’t forget to place these three magic words next to every text offer. If you fail to include this call to action, you won’t experience results. Subscribers will simply think you’re firing out generic announcements. This will then devalue your entire list purpose. Remember people, it’s only three simple words. But, these three words can make or break your offer redemption. 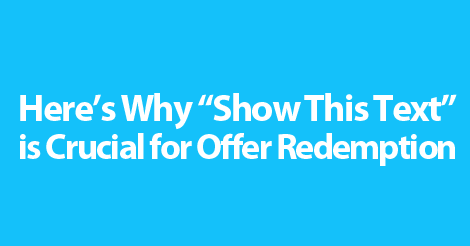 Without offer redemption, text marketing becomes borderline pointless. Partner up with the best online texting service, Slicktext.com. Want to learn more? Give us a call today at 1.800.688.6290. Ready to get started? Head over to our pricing page, and sign up for a free plan. We offer text marketing solutions that make offer redemption an absolute breeze. Couple the above advice with helpful tips from our text marketing learning center, and you’ll be good to go.